If you have had a conversation about ESU LokSound DCC Decoders with anyone at some point the phrase LokProgammer gets tossed out. LokProgrammer is a computer software program and a serial communication converter device. NOTE! YOU CAN USE THE SOFTWARE WITHOUT THE HARDWARE. The physical device facilitates communication between the computer and the decoder. The only procedure you must use a LokProgrammer to do is update firmware and load sound files. You can still use the software to calculate CV values, you just have to manually program them using you command station or other means. The software is much like JMRI/Decoder Pro in that it is a graphic user interface to simplify and organize the task of programming decoder CVs. 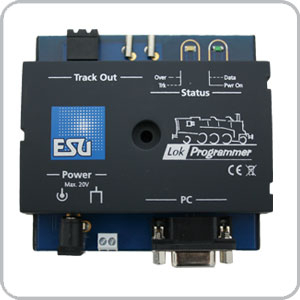 LokProgrammer is produced by ESU for use with ESU products. This means it only works with ESU products. You cannot use LokProgammer with any other brand. It also means it is optimized for ESU products. It uses proprietary communication protocols so it is much faster than JMRI/Decoder Pro and it is refined for the needs their product only. I am aware of two models of LokProgrammer hardware. They are functionally identical meaning they do the same thing the same way. There is no benefit to having a new model versus an old model. ESU, LLC is sensitive to the added expense of having to purchase a LokProgrammer for personal use and has stated emphatically there are no known plans to change revise or otherwise update the LokProgrammer. The point here is that unless it becomes technologically obsolete as the product line matures, this is a one time expense and the intend to work within these constraints as long a feasibly possible. In my own mind, they change I can forsee is a new model that updates the RS232 connection to a current version USB connector but that is simply pure speculation on my part. 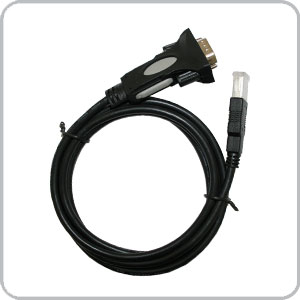 There are two known RS232 to USB cables used to connect the physical device to a computer. The current model uses a FTDI USB-A 2.0 on RS232 chipset and has proven to be very reliable among LokProgrammer users. I don't have a lot a lot of info available on the old version or even a picture in my files except that it was gray and it was very problematic in communicating with some versions of Microsoft Windows software and or PC hardware. Bottom line, if your cable does not look like this and you are having problems get a new cable. These cables have internal microchips that store identification data and device drivers and somewhere along the way the original cable became incompatible with the current versions of MS Windows. LokProgrammer software is a free computer program that can be downloaded from the ESU Website HERE. There are two components to the software; LokProgrammer and the Template Pack. LokProgrammer is the GUI for working with ESU products. The Template Pack is a collection of sound file elements that can be used with LokProgrammer and LokSound v4.0 Sound Decoders to create custom sound projects. I don't want to get into that here except to say go to the ESU Yahoo Group and ask questions if you are interested. The software is configured to check for the most current version on startup by default. It is always recommended to use the most current version LokProgrammer software. The decoder firmware version is directly associated with LokProgrammer software version. By default, when you update to the most current version of LokProgrammer you will get the most current version of decoder firmware. After many years using the LokProgrammer on nearly every version of Windows since WIN98 I can say it is a well-managed product. Just like everything else, technology is not flawless and there are occasional challenges to using LokProgrammer and communicating with ESU products. If you get an ERROR message, the hardest thing to know is why and more important what to do next. This is my check-down list when things aren't working. These tips should not be construed as anything more than an opportunity to share my collection of tips and tricks acquired from many years of experience working with LokProgrammer. Verify the decoder type and firmware version by choosing Programmer/Extended decoder information from the Top Nav Menu. Force a firmware update. Sometimes decoders just get confused and a manual firmware update fixes a lot of issues. This can be done manually with the LokProgrammer software by selecting Tools/Update decoder firmware from the Top Nav Menu. Some motors simply don't have enough resistance to be seen by the programmer. LokProgrammer must detect resistance across the motor or it will not program the decoder. Insert a 100 to 1000 ohm 1/4 Watt resistor in parallel with the track leads; even better, wire the resistor in parallel with the motor. Clean your track and wheels. Jumper directly to red and black wires. Program on a LokTester. Verify track joints. Verify connection between computer and LokProgrammer and track. Add dead weight on top of the model if decoder is installed in a loco. The weight will help to improve the continuity between loco wheel and rail. Try a larger power supply. Many people replace the stock wall wart with something with guts like a laptop brick. I use an old MRC Control Master 20 DC power pack. High power and adjustable... The extra volts and amps helps push the data in. Make sure you have the latest version of LokProgrammer. Can't use old computer software with newer decoder software. Make sure the decoder you are working with is the only decoder you are working with. My test track/programming station at the Backshop is a universal tool including multiple LokTesters and test tracks interconnected for many reasons. I cannot count the number of times I had a loco on the track or a decoder on a LokTester only to discover it after hours of asking WHY WON'T YOU PROGRAM THIS DECODER. LokProgrammer will only program one decoder at a time. The first thing the programming routine does internally is read the extended decoder information and verifies the open CV data/sound file is compatible. If you have any other decoder in the loop you WILL get an error.